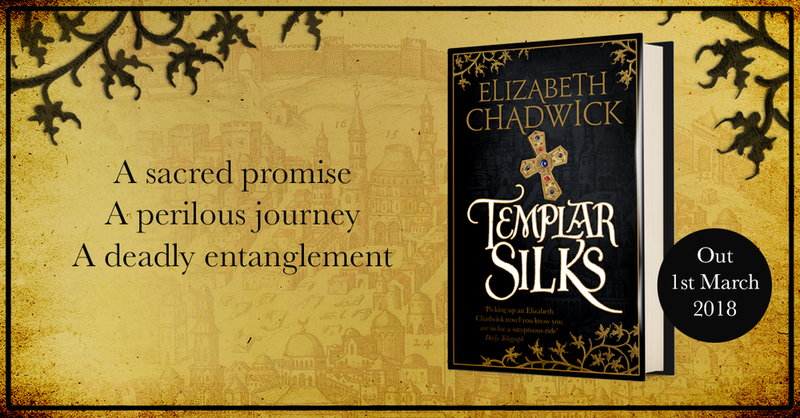 Elizabeth Chadwick’s glorious new adventure is published today by Sphere in hardback, ebook and audiobook, narrated by Jonathan Keeble. TEMPLAR SILKS marks an exciting return to the character of William Marshal, England’s greatest medieval knight, following him across continents, from England to Jerusalem, as from his deathbed he recalls a crucial journey to the Holy City, and the peril and heartbreak he found there. William Marshal was an Anglo-Norman soldier and statesman who served five English kings, eulogised by Stephen Langton as the ‘best knight that ever lived’. Elizabeth Chadwick’s novels about him are widely praised, and her vivid depiction of this extraordinary man in books like THE GREATEST KNIGHT has made him one of her best-loved characters. Fulfilling a vow he had made while on crusade – the subject of this thrilling new novel – William Marshal was invested into the order of the Knights Templar on his deathbed in1219. He was buried in the Temple Church in London, where his tomb can still be seen. Elizabeth Chadwick’s bestselling standalones THE GREATEST KNIGHT and THE SCARLET LION also feature this compelling historical figure, while characters around William feature in other novels – among them his father John Marshal in A PLACE BEYOND COURAGE and his daughter Mahelt (also called Maud) in TO DEFY A KING, which won the Romantic Novelists’ Association Historical Novel of the Year Award in 2011. US rights to TEMPLAR SILKS have been sold to Shana Drehs of Sourcebooks, with German rights going to Blanvalet and Czech rights to Euromedia, with option publishers elsewhere including Portugal, Poland, Russia and Latvia. Her work is published in 24 languages and has sold more than a million copies in the UK alone. A sacred promise. A perilous journey. A deadly entanglement. Lying on his deathbed, William Marshal, regent of England, sends a trusted friend on a journey to bring him the silk Templar burial shrouds that he has kept hidden since returning from the Holy Land thirty years ago. It is time to fulfil his Templar vows and become one of their order for eternity. While he waits, William vividly recalls his long-ago pilgrimage to Jerusalem with his brother Ancel, and their sacred mission to bear the cloak of their dead young lord to Christ's tomb in the church of the Holy Sepulchre. Their journey is fraught with uncertainty and danger, but it is in Jerusalem, the holiest and most dangerous of cities, that William becomes entangled with the mercurial Paschia de Riveri, concubine of the highest churchman in the land. He has travelled a long and risky road to save his soul, but now the greatest danger he faces is losing his heart. Elizabeth Chadwick won a Betty Trask Award for THE WILD HUNT, her first novel, and has been shortlisted for the Romantic Novelists' Award several times, winning in 2011 for TO DEFY A KING. THE SCARLET LION was selected by Historical Novel Society founder Richard Lee as one of his 'Ten Landmark Historical Novels of the Last Decade'. THE AUTUMN THRONE is published in hardback today by Sphere, concluding the glorious retelling of the life of one the most powerful women in medieval Europe, Eleanor of Aquitaine, by one of the most-loved historical writers today, New York Times bestseller Elizabeth Chadwick. Chadwick’s ELEANOR OF AQUITAINE trilogy opened with THE SUMMER QUEEN and was followed by THE WINTER CROWN, and was described by Choice Magazine as ‘engrossingly written and well researched.’ The beloved trilogy is being published in the UK, the USA, Germany, Portugal, Poland, Latvia, the Czech Republic, Bulgaria and Russia, with more languages expected. England, 1176. Imprisoned by her husband, King Henry II, Eleanor of Aquitaine, Queen of England, refuses to let her powerful husband bully her into submission, even as he forces her away from her children and her birthright. Freed only by Henry's death, Eleanor becomes dowager Queen of England. But the competition for land and power that Henry stirred up among his sons has intensified to a dangerous rivalry. Eleanor needs every ounce of courage and fortitude as she crosses the Alps on horseback in winter to bring Richard his bride, and travels medieval Europe to ransom her beloved son. But even her indomitable spirit will be tested to its limits as she attempts to keep the peace between her warring sons, and find places in the centres of power for her daughters. Read more about Elizabeth Chadwick on the Blake Friedmann website or her website. Follow Elizabeth on Twitter and Facebook.